The 32nd annual Freihofer’s Kids’ Run will be held on Saturday, June 1 on Washington Avenue using the same start and finish as the other events. Please refer to schedule below. No matter what your age, running is wonderful exercise and a lot fun. In order to introduce Capital Region youngsters to the joys and benefits of physical fitness, the Freihofer’s Baking Company is once again proud to sponsor the free Freihofer’s Kids’ Run. It’s a great chance to meet other kids who share an interest in running. What a super way to have fun, and stay fit & healthy. 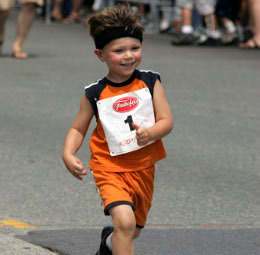 The Freihofer’s Kids’ Run is a series of free mini road races, ranging in distance from 50m to 1 mile. 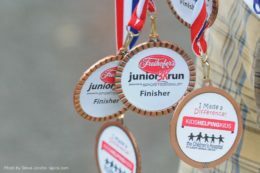 The Kids’ Run is open to children between 3 and 11 years of age. There will be plenty of entertainment to keep kids occupied. There are three ways to register for the Kids’ Run. You may register online, print and mail an entry form or register in person the day before the race, from Noon to 7:00 p.m. or on race day at 10:00 a.m. at race packet pick up. Online registration for the Kids’ Run will end the Monday before the race at Noon. The Kids Run is Free! In order to ensure the safety of all participants, races will run in waves. All participants will be held in “Parent Pick-Up” areas until they are met by a parent or guardian. So, come out and enjoy the excitement of the Annual Freihofer’s Kids’ Run. Just by participating, you’ll be a winner! 9-11 Years 1 Mile 11:00 a.m. – 11:20 a.m. Washington Ave.
1-4 Years* (multiple heats) 50 Meters Immediately following the Mile. Washington Ave.
4-6 Years (multiple heats) 100 Meters Immediately following the 50m Washington Ave.
4-8 Years (multiple heats) 200 Meters Immediately following the 100m Washington Ave.
4-10 Years (multiple heats) 400 Meters Immediately following the 200m Washington Ave.
*Must be accompanied in the race by a parent or legal guardian. No strollers please – non physically-challenged children must be walking. ALL DISTANCES ARE RUN IN HEATS UNTIL ALL KIDS HAVE PARTICIPATED. All listed race times are approximate and will begin and/or end based on participation levels. Children will not be released from the finish area until met by a parent or guardian at exit chute. Please see the Event Schedule page for packet pickup. We will have fun and entertainment for the family throughout the day.